I remember when Princess House and Interior Decorating were all the rage for home makers. I was invited to parties and I even went… to covet mostly, I admit. Normal people couldn’t afford the wonderful household pretties these companies offered. At one of those parties I bought a set of small square mirrors. I still have one of those mirrors but it doesn’t decorate my house. It’s old and alone and too small to be of any use. The vase is beautiful. The little lid with holes for the top lets you arrange the flowers nicely with plenty of space. Even the stems are beautiful through the glass and water. I looked it up on line to see what it’s worth in dollars. Etsy has one, not as large, without the lid for 18 dollars. 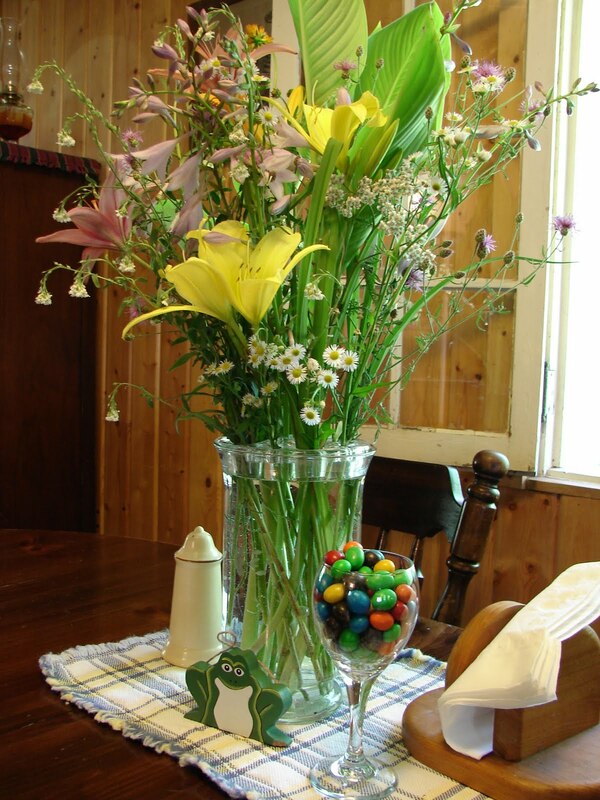 It’s worth a lot more than that to me to have fresh flowers on my table all summer from the garden. Thanks, Lisl, for sharing this lovely vase with me while you’re home. I would love that Judy, please do.